The Messerschmitt Bf 109E was an early version of this powerful German World War II fighter. 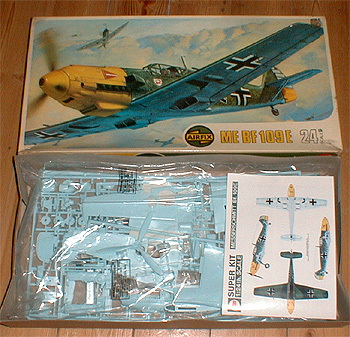 It was designed by Professor Willi Messerschmitt and was better armed and armoured than the Bf 109C it replaced. It gained for the Luftwaffe the essential air superiority needed to support early German campaigns in Europe. This Super Kit with over 150 parts contains a wealth of detail. The armament of two 20 mm cannon and two 7.9 mm machine guns is accurately reproduced with their ammunition boxes. It has a hinged cockpit canopy, retractable undercarriage, and flexible tyres. The 1,100 h.p; Daimler Benz engine is superbly detailed beneath removable engine panels and the propeller may be motorised. The markings are for two representative Bf 109Es which took part in the Battle of Britain - firstly, Yellow 10 from Jagdgeschwader JG 26, 9 Staffel/III Gruppe; alternatively, the personal markings of the German Ace Gruppen Kommandeur Major Helmut Wick of JG 2/1 Gruppe.